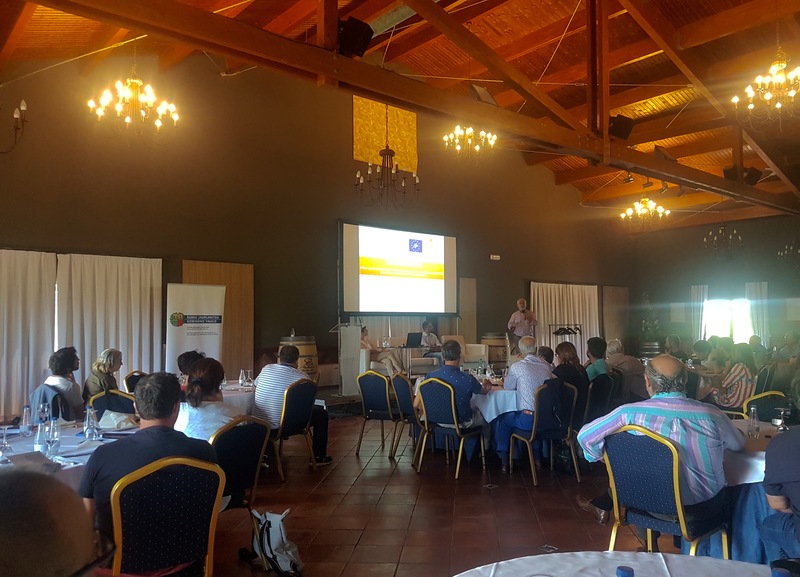 Last July 5th, in the course on A SUSTAINABLE FUTURE IN THE WORLD OF WINE organized by the University of the Basque Country in Laguardia, capital of the Rioja Alavesa, the VINEYARDS4HEAT project was presented as a reality that makes the world of wine more sustainable. The presentation was given by the project Coordinator, Jordi Cuyàs, who summarized the Penedès experience and encouraged the producers and wine makers of the Rioja Alavesa to advance along this path that they have already initiated of the hand of the agency of Rural, Coastal and Food Development of the Basque Country, HAZI, who during the past pruning gathered 8 t. of vine shoots, of which half of these will be made into pellets within the program of this organism to take advantage of the forest biomass and also the agricultural one as energy, as explained by one of its responsible, Borja Monje, that defined his project like the one of the “young nephews” of the Penedès experience. The proposal was very well received by the sixty participants to the course in which the Penedès’ speaker Rosa Aguado, from Can Ràfols dels Caus, explained the experience of Qalidès and the Navarra’s speaker Félix Cebrián explained the genetic diversity of the wine-growing varieties and the challenges that are opened to have more resistant plants and adapted to the situation of each place, an issue that is on the table when it comes to raise the issue a more sustainable and healthy production.